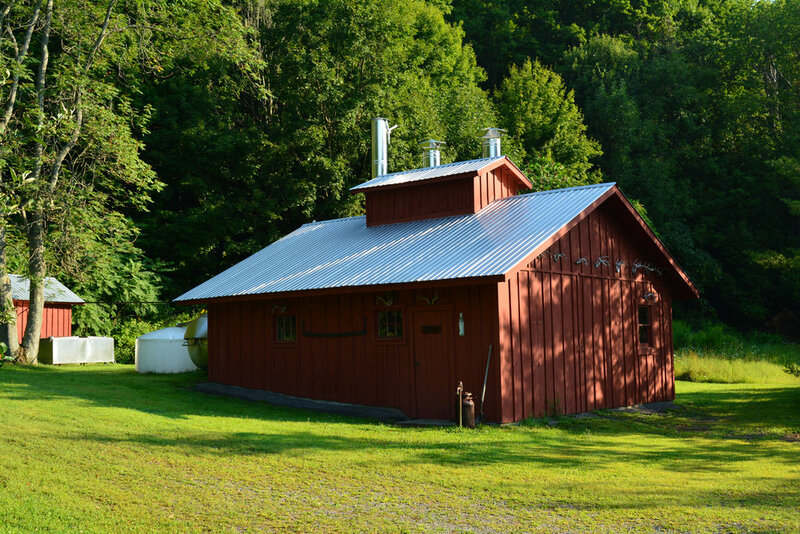 Maple Hill Farms pure maple syrup is all natural and produced by boiling the sap from sugar maple trees to concentrate the sugar. Since 1982 Maple Hill Farms has produced syrup in small batches from its exclusive maple sugar tree forest to ensure you enjoy only the highest quality maple syrup. From mid-February to the end of March the collected maple tree sap is boiled down and concentrated until it reaches the point of being a various grade of syrup. This process takes approximately 48 gallons of maple sap to create just 1 gallon of syrup and we taste and color grade every batch to make sure is meets our high quality standards. Maple HIll Farms makes Dark, Amber, and Very Dark grades of Maple Syrup. Dark Grade A Pure Maple Syrup has a darker color and more robust taste. Amber Grade A Pure Maple Syrup has a lighter color and richer taste. Very Dark Grade A Pure Maple Syrup is usually made near the end of the sugaring season and is very dark with a very strong flavor. In addition to syrup, Maple Hill Farms makes Pure Maple Sugar, Maple Candy, Maple Cream, and Bourbon Barrel Aged Pure Maple Syrup. Maple Hill Farms limited production Bourbon Barrel Aged Syrup is Grade A Amber Pure Maple Syrup aged in authentic Kentucky Bourbon Barrels for several months to capture the unique flavors of each barrel for a truly delicious variety of maple syrup. Please see a visual tour of the Farm and process below.